Custom Built Only / Free shipping US mainland and Canada. Premium Sauna Comfort. All Basswood. Custom Designed and Hand Made in the USA. TODD – MILW WISC – April 18, 2018 Customer service is very evident to be a high priority with Sauna Comfort. From the first phone call right through our sauna being delivered. Rich attentively answered all questions, and openly listened to my concerns. Levi didn’t disappoint on Amish quality expectations. After looking at all options, we have no regret going with Sauna Comfort. Looking forward to future health benefits, from using a near infrared sauna. – May 16, 2018 We LOVE our sauna. The workmanship is outstanding. It’s like a work of art. Customer service was excellent. We had a question regarding assembly and the matter was resolved in a most excellent way. We have been using our sauna for about 8 months now with wonderful results. I highly recommend Rich and Sauna Comfort. * – June 11, 2018 I enjoyed the sauna comfy at home so much that I purchased the full Basswood Sauna Comfort for my office for clients to use! I can’t tell you how impressive the quality is! Clients have been enjoying the benefits and some even purchasing a sauna comfy for their home. I have now owned my sauna for almost two years and cannot recommend it enough. I am 48 and not getting any younger. I work hard, play harder, have been very rough on my body and now pay for it by dealing with pain on a daily basis. Years of over the counter anti inflammatories have caused more bad than good. My wife is a nurse and we did our homework before purchasing this particular sauna. What a good decision! Pain management doesn’t have to come in a pill. To start, the personal attention Rich gives to each customer is fantastic. The sauna is a work of art and that is not hyperbole. There is not a defect on this thing and we recently moved and had to disassemble, transport, and reassemble and it has gone back together like the first time I built it. Not only do I use it but my wife and three children use it as well. I like to “preheat” my sauna to get the temp up and then use it for 30-45 mins per session. My muscles and joints feel better within 10 mins. My skin looks younger than it did several years ago and being from Northern Wisconsin (wood tick ground zero) this sauna helps us treat Lyme disease. 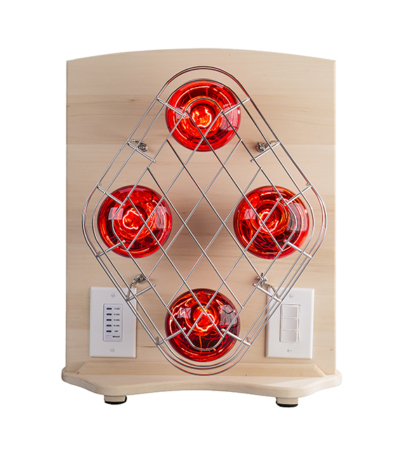 If you want to feel better start using Near Infrared by Sauna Comfort. Even my husband commented on the quality and ease of assembly in setting this sauna up!! With a touch of a button it’s ready to go!! After every sauna session I always feel better, pain is always reduced or eliminated, my body feels lighter, my mood is improved.